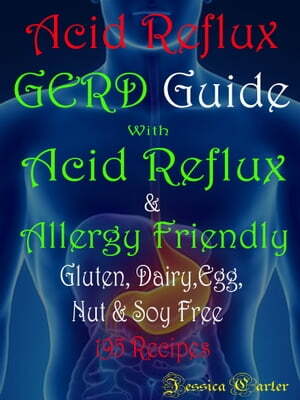 Collins Booksellers - Acid Reflux GERD Guide: With Acid Reflux & Allergy friendly by Jessica Carter, 1230000311408. Buy this book online. Acid reflux or GERD (Gastroesophageal reflux disease) is a condition in which stomach acids rise up into the esophagus because the valve that separates the stomach contents from the esophagus is faulty. A recent research study linked peptic disease (heartburn, GERD, stomach ulcer) to gluten exposure in patients with gluten sensitivity. We have found that when a patient stops eating the foods that have been identified as an allergy food for them, it can have an enormous effect on their GERD, often completing relieving their symptoms. As many as four in 10 have symptoms of gastroesophageal reflux disease, or GERD, and many depend on P.P.I.’s like Prilosec, Prevacid and Nexium to reduce stomach acid. These are the third highest-selling class of drugs in the United States, after antipsychotics and statins, with more than 100 million prescriptions and $13.9 billion in sales in addition to over-the-counter sales. More than 60 million American adults experience heartburn at least once a month, and about 25 million adults suffer daily from heartburn. Twenty-five percent of pregnant women experience daily heartburn. Recent studies show that GERD in infants and children is more common than previously recognized and may produce recurrent vomiting, coughing, and other respiratory problems.